Have started ‘Soul Mountain’ by Nobel Literature Laureate Gao Xingjian who is also an established painter. 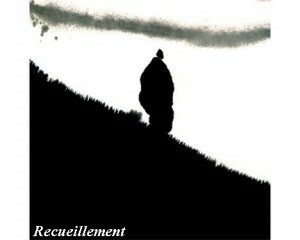 The illustration here is from one of his ink paintings, ‘Recueillement’, roughly translated as ‘meditation’. ‘Soul Mountain’ has been patiently sitting on my shelf for about two years. I think I found it in the wonderful War on Want bookshop in Botanic Avenue, a shop full of little treasures, which is often supervised by very genteel ladies and where classical music plays quietly in the background. 3rd December. Finished ‘How Novels Work’ by John Mullan based on his weekly articles for The Guardian, ‘Elements of Fiction’. Was expecting it to be much the same as David Lodge’s ‘The Art of Fiction’ & ‘The Practice of Writing’ but it explored new territory, I felt. 1st December. Interviewed by Devlin Barrett of the The Wall Street Journal, about the ongoing attempts by the US Department of Justice and the British authorities to subpoena Boston College for access to its Belfast Project (taped interviews with former members of the IRA). 26th November. Spoke at Sinn Féin night at Dunsilly Hotel, Antrim, about the legacy of the 1981 hunger strike. 19th November. Every Christmas I receive a pile of books as presents and I like to finish all of them before the next Christmas! Today, finished reading Clive James’ massive volume, ‘Cultural Amnesia’, which I read at a leisurely pace. One more book to go! 11th November. Took part in a panel discussion at St Mary’s Grammar School, Glen Road, Belfast. 10th November. Spoke, along with Sile Darragh, at a hunger strike commemoration in Sligo. Great turnout. Lots of new faces and, of course, old faces of friends and comrades. 8th November. At the invitation of Eamon Phoenix took part in a panel discussion in Stranmillis College in front of twenty postgraduates in Conflict Studies from Atlanta, USA. Also participating were Roy Garland (political commentator), Nichola Mallon (SDLP), and Mary Gethins (consultant in human resources and author of a book on Catholics in the police in the North).